Throughout December, thousands of KIPPsters across the country participated in the 2018 Hour of Code (HoC), a global movement to celebrate and broaden participation in the field of computer science. 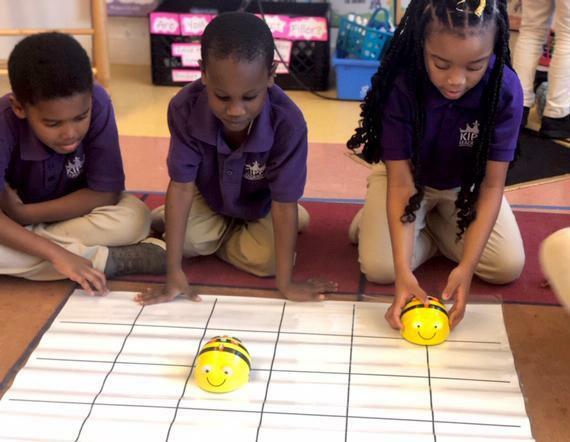 At KIPP Leadership, students in grades K–2 learned about and programmed Bee-Bots to move and turn based on coded commands. The unit culminated in a Bee-Bot Bee! Check out this short video of the Bee and a Bee-Bot unit plan created by Emily McGrath (Elementary Science Director) and Paola Valdivia (Middle School Science Director). Shout out to all the teachers and leaders involved: Abigail Littman (organizer), Imani Fox, TJ Bentley, Quiana Stewart, Delaney Herndon, Missy Scott, Jenni Seckle, Seymour Killins, and Margaret Phoenix. Another shout out to all our amazing teacher who implemented an Hour of Code into their lesson plans. The impact of Hour of Code reaches way beyond a single lesson or celebration. Students learn skills and are introduced to concepts that grow creativity, collaboration, critical thinking skills, and joy!